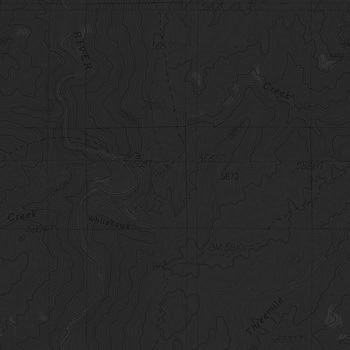 Including other attempts cancelled before launch, this would be about my fifth 2012 effort to reach Trinity Mountain. I was kind of determined. I took the day off work and left as early as I could after getting the kids ready for school. I planned a big loop up through the Trinities to near Atlanta and back which would require much of the available daylight. It was still chilly, about 40°F, but three layers and heated grips kept me cozy as I cut across the open land behind Micron along the old Oregon Trail. The Oregon Trail is one of our few National Historic Trails.¹ It’s a little known fact that the immigrants’ hubcaps, energy drink bottles and worn shoes still litter the path. This stretch between Technology Way and Bonneville Point usually has a few trash dumps (I also passed a shot-up TV and roll of carpet). I couldn’t pass by the historic origin¹ of “Boise” without a quick stop to admire the locust tree thorns and look back across the valley. Weekend rain made the dirt and gravel roads more enjoyable than usual — good traction, not dusty. There were, however, hoards of hunters seeking to dismember the living and eat their flesh. You have to take the bad with the good. It was crowded, hot and dusty when last we stopped here. Now, the opposite. When snow kept us from Trinity Lakes, we retreated to camp here along Fall Creek.¹ It was fun to see our spot at the opposite end of the year. Jessica warned me that she’d heard of snow in the mountains but I was still determined to go. So far the only difficult area was the eastern side of House Mountain where the road was snow-packed in places. I didn’t stop for pictures since I was preoccupied with anxiety. Jessica spent some time digging this out for Brenna when we were camped here. It was mostly under water then so I didn’t fully appreciate her fine work. A good knobby may have provided reasonable propulsion but the end-of-season TKC could only push the pig uphill at about 1 MPH (I saw a high of 1.1 on the GPS). I was still determined to get over the mountain. We just needed several breaks, the two of us, to cool down along the way. Beautiful and a bit depressing at the same time. As I’d been doing for some time now, I walked ahead to scout and make tracks along the best route while the motorcycle cooled. I didn’t think slipping off the road would be fun but was too committed to quit. I thought I would setup the tripod for a triumphant picture of us, the motorcycle and I, at the saddle summit but I just wanted to puke at this point (old age plus exertion) so instead slumped on the seat for a minute. Although I’ve seen plenty of wildfire aftermath in years of Idaho riding, somehow the summer of dire news left me with an image of a bare and blackened landscape.¹ The burn area began right at the ridge and I was almost surprised to see green trees remaining. … riding on the edge of juxtaposition. It was a glorious day to be up here. I didn’t feel up to the additional exertion of even the short access roads to Big Roaring River, Little Roaring River or Big Trinity Lake. My legs were starting to cramp from the constant toe dabs needed to keep the GS up so I was glad to stop for a short break and my PBJ at the edge of Little Trinity Lake alongside the road. I walked a short distance around the edge of the lake while eating my sandwich. The danger of falling trees was evident with many already on the ground like this. It’s understandable that land managers wouldn’t want campers up here for a while. I should have included something for perspective. The tall, thin trees here were the regular size trees everywhere else. I saw a couple of these monsters burned and broken. Under 7,500 feet the roads were about perfect. I had to see it a couple times before I realized all the red must be fire retardant. I had never been up the Middle Fork this far. I really liked the ruggedness. There were a few small spots where fire jumped the river but it looked like crews had been able to hold it here. It is hunting season. Most every draw, big and small, and a few inexplicable locations, were pickup truck parking lots. If car thiefs want to score they should really consider visiting Idaho in October and November. Dusty and gravelly, stuck behind cars, I didn’t think riding around Arrowrock Reservoir was so pleasant in the summer. On this autumn evening, however, it was a real joy. When planning began in 1910, Arrowrock Dam would be the largest of its type in the world.¹ During construction, the site was home to 1,400 workers. As I rode by, however, I could have been the only person in the world. Wrestling through the snow made me a couple hours later than planned but it was a beautiful ride with no tips or tumbles. I saw the last of the sunrise as I departed and rode the winding highway into the sunset on my way home. Thanks to my wife Jessica for handling the day’s errands while I reconditioned (drained and recharged) my batteries, charging through the mountains.